The Red/Green Go/No Go Yes/No Magnet is a plastic coated ferrite magnet that can be used as a planning magnet, warehouse magnet or notice board magnet. One side has a Green plastic coating; the other side has a Red plastic coating. Simply turn the magnet over to swap the main colour seen. With an operating temperature of up to 250 ° C can also be labeled easily hot parts. Just change the magnets on the main color! 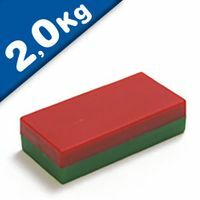 This red and green lacquered block magnet is the most popular education magnet. Its grade of magnetization is moderate so even smaller children can handle them easily without risking injury. 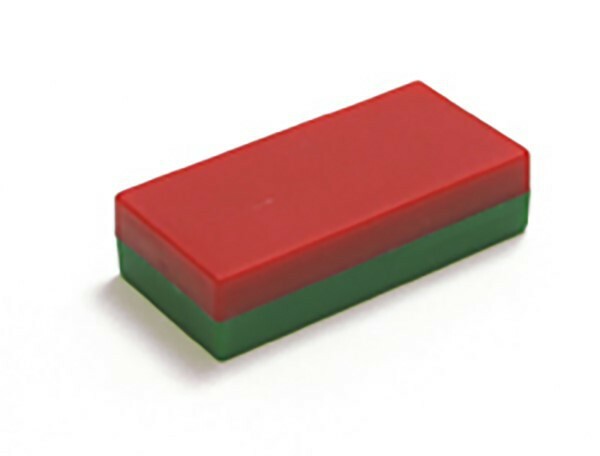 This red and green lacquered block magnet is the most popular education magnet. Its grade of magnetization is moderate so even smaller children can handle them easily without risking injury. Blocks of ferrite consist of hard ferrite, which belongs to the group of ceramic materials. Hard ferrites are extremely hard and brittle. Ferrites are the cheapest and most popular permanent magnets.The Red/Green Go/No Go Yes/No Magnet is a plastic coated ferrite magnet that can be used as a planning magnet, warehouse magnet or notice board magnet. One side has a Green plastic coating; the other side has a Red plastic coating. Simply turn the magnet over to swap the main colour seen. With an operating temperature of up to 250 ° C can also be labeled easily hot parts. Just change the magnets on the main color! Ferrite magnets are easily identified by their dark graphite grey colour, they are very inert, they do not rust and do not require any protective plating. They have a reasonable resistance to demagnetisation and are extremely popular due to their characteristics. Ferrite magnets are corrosion free – for long term performance they are superb; if looked after they are capable of exceeding most products lifecycles. Ferrite magnets can be used up to +250 degrees C (and in some cases up to +300 deg C). Ferrite magnets are also low cost, particularly in high volume production runs. We offer 27 grades of ferrite permanent magnet. Ferrite Magnets are the best value permanent magnet available due to an abundance of raw materials and economical cost to manufacture. They are ideal for creating a deep magnetic field inexpensively. Magnosphere stock’s a wide range of ferrite magnets for almost any application. Ferrite magnets are corrosion free – for long term performance they are superb; if looked after they are capable of exceeding most products lifecycles. Ferrite magnets can be used up to +250 degrees C (and in some cases up to +300 deg C). Ferrite magnets are also low cost, particularly in high volume production runs. The ferrite ceramic magnets are resistant to demagnetization. These sintered permanent magnets show less coercivity. The ferrite ceramic magnets are brittle and are prone to breakage. Due to their brittle nature they cannot be drilled or machined. Electronic inductors, Transformers, Computers, Loud speakers, In radar as absorbing particles, Industrial automation, Conveyor belts, Electric motors, Magnetic separators, Magnetic resonance imaging. Who supplies high quality Red/Green Magnetic Blocks, Ferrite? Magnosphere offers best priced Red/Green Magnetic Blocks, Ferrite globally to all industries, including Automotive, Aerospace, Military, Advertising, Design House, Electronic and Academic/R&D. Please inquire for custom Neodymium magnets or magnetic assembly. Buy Red/Green Magnetic Blocks, Ferrite at Magnosphere and get a better deal!